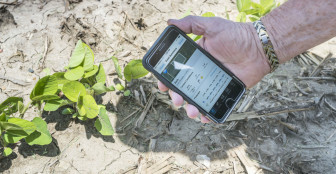 Apgar Farms representative Tom Austin demonstrates some of the data available on the Climate Corporation app used at the farm's operation near Tuscola, Ill., on June 10, 2015. Monsanto has pledged to become carbon neutral by 2021. The Carbon-Neutral Collaborative is a “consortium of experts on agricultural greenhouse gases,” according to Monsanto. Its membership includes AgSolver Inc., Applied GeoSolutions, Crop Grower LLC, the National Corn Growers Association and a handful of prominent academic groups, including the University of Illinois at Chicago and Kansas State University. Monsanto’s latest announcement comes one year after the company first outlined its ambitious plans to become completely carbon neutral, or have a net zero carbon footprint. The Carbon-Neutral Collaborative will advise Monsanto on how to advance its commitment on climate-smart agriculture, according to the company. In early 2016, Monsanto also commissioned a third-party study to examine potential ways to reduce greenhouse gas emissions through agriculture techniques. Released in June, the study found that widespread adoption of certain practices — cover crops, conservation tillage and precision nutrient management among them — could result in more than 100 million metric tons of carbon dioxide-equivalent emissions reductions in the United States alone. “Climate change is one of the biggest issues we face in agriculture, as well as one of the most pressing challenges facing humanity,” Monsanto Chairman and Chief Executive Officer Hugh Grant said last year when announcing the company’s carbon-neutral pledge.